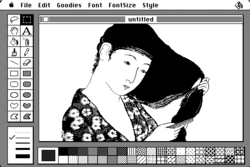 MacPaint was a bitmap-based graphics painting software program developed by Apple Computer and released with the original Macintosh personal computer on January 24, 1984. It was sold separately for US$195 with its word processor counterpart, MacWrite. MacPaint was notable because it could generate graphics that could be used by other applications. Using the mouse, and the clipboard and QuickDraw picture language, pictures could be cut from MacPaint and pasted into MacWrite documents. Pictures could also be cut from MacPaint and pasted into the resource fork of any application via ResEdit, allowing application internationalization.